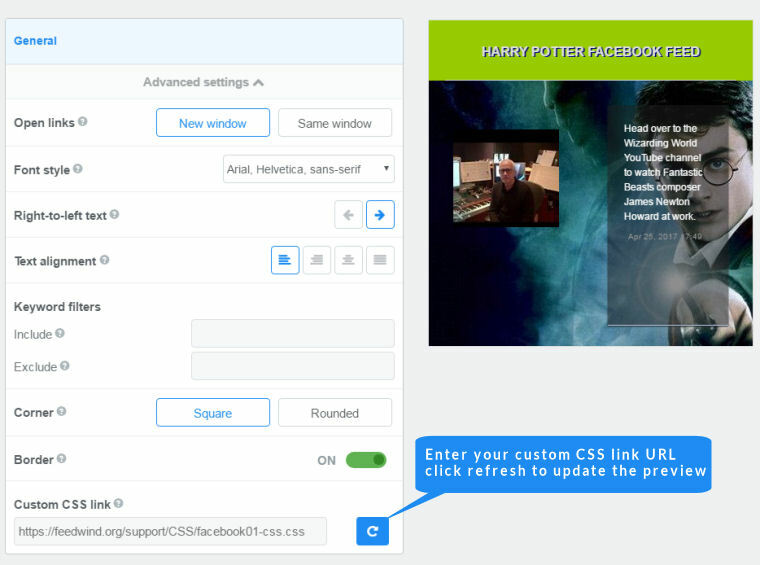 As with all our widgets, you can use CSS to create a custom Facebook widget and match any website design. The setup screen for our Facebook feed widget allows you to create a variety of different styles. However, we understand you may need a news feed widget styled to match your site design more closely; using CSS you can achieve almost any styling you want. Tip: If you use an online platform or for any other reason you want to host your CSS file elsewhere, please check out this article on how to use Dropbox to host CSS. Use your favorite text editor or software to prepare the CSS file. Notepad++ is a great free editor that is ideal for creating a CSS file, but there are others available online. All you need is a text editor that does not apply any formatting such as font sizing etc..
A basic file would look something like the example (see below), and produce the custom facebook widget you see in the example below. As you can see the CSS is split into three sections; the Container, Header and Content. We have commented these . You can simply copy this code into your code/text editor and modify the contents, then save is as myfilename.css (or whatever name you want but it must have the .css extension). Place the CSS file on your local server or use a service such as Dropbox to store your CSS file offsite. Copy the URL for use in the Feedwind setup screen. Click on the >Advanced Settings link in the “General” section of the setup screen. Enter the URL of the custom CSS location in URL of Custom CSS box. The new custom facebook widget design will display in the Preview area. Note: When using a custom CSS, some parts of the FeedWind settings screen will be greyed out and disabled. This is to prevent conflicts between FeedWind’s default settings and settings in the custom CSS. FeedWind has the option to set the maximum length of the titles and content of feeds by specifying the number of characters to display. FeedWind automatically adjusts the number of feeds shown based on the value entered for the maximum length. Sometimes a feed item can display outside the container depending on the line-height and other settings in the custom CSS. In this case, please adjust the settings in the CSS file or adjust the number of characters allowed in the titles/content. Note: It is not possible to use every CSS command in a FeedWind custom CSS. For example, -repeat commands for wrapper images in the header are not supported. We cannot cover every eventuality as there are so many potentially available CSS operators and parameter combinations. Usually, the easiest way to find out if your CSS works with FeedWind is by adding a new item into the CSS and refreshing your web page to see how it appears.